In the recent days, fighting in Eastern Ukraine intensified once again with the Russian side, starting the next round of (previously-announced) escalation. 18 Ukrainian soldiers were killed and wounded over the last 24 hours without any political actor – neither in Europe or Kiev – calling Russia’s current “Minsk 2 bluff” and declaring the treaty as broken and consequences to be implemented immediately. But this appeasing silence doesn’t only cover up dead Ukrainian troops and daily Minsk 2 violations by the Russian side (using violence in principal and weapons, forbidden by the signed treaty) It also conceals more territorial losses by the Ukrainian side. I documented and proved the loss of Kominternove, Pavlopil, Pyshchevyk, half of Shyrokyne and two bridgeheads on the Ukrainian side of the Serversky-Donets river, just shortly after the ink under the Minsk 2 treaty dried. But the Russian advance continues with one focus being Mariupol, on which the invasion army is creepingly closing in, meter by meter over the last two months. The last position that fell under their control is the village of Vodyane, located 2 km to the N-E of Lebedyns’ke and 7 km East of the Mariupol city limits itself. The last solid confirmation that Vodyane was under Ukrainian forces’ control appeared at March 2 and March 7 when the Ukrainian army command of sector M reported small arms and mortar attacks on the village. While there were some more reports about fighting in the area, my map from March 21 raised first (slight) doubt about who controls the village, leaving the possibility that it turned into “no man’s land” between the two parties. Then yesterday, April 13, final confirmation came from Regiment Azov that the village was not just what the Ukrainian military calls “located in a buffer zone”, but fell back under full Russian control and now serves as an artillery firing position for 122 mm pieces, most probably Russian army D-30 systems. The Azov tank commander also said, Ukrainian forces had to attack Russian positions in the village with heavy weapons to silence the artillery fire for the moment. The “Before and After” map below show the situation as it looked before the confirmation of the loss and now, based on an informed estimate and the inclusion of all available sources. The severeness of the territorial situation becomes even more obvious / frightening, when comparing what Regiment Azov and other Ukrainian forces recaptured from the Russian occupation army in early February and what is left of these gains now after the fall of Vodyane. 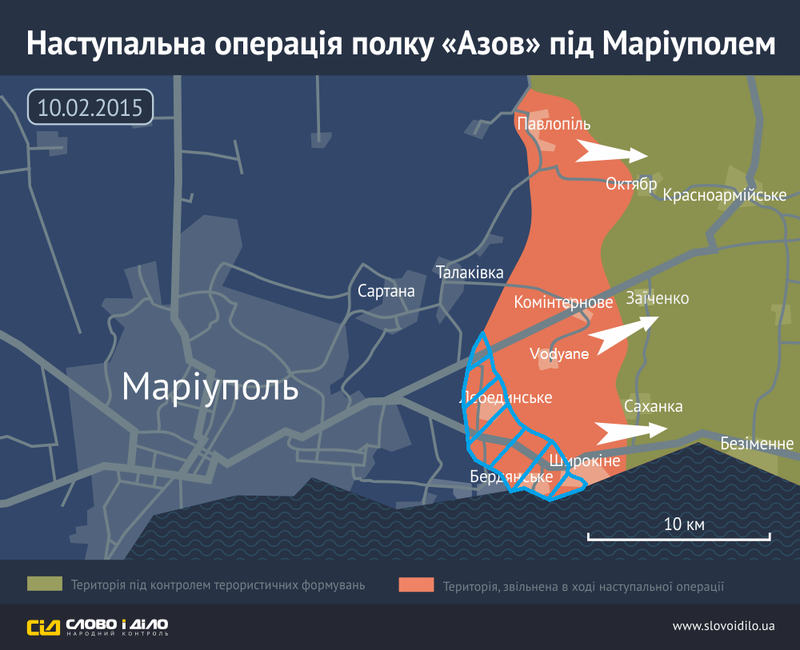 As it can be seen in the map, the buffer zone, Ukrainian forces created in their 3-day blitz in February to safeguard Mariupol is almost nonexistent by now. All territorial losses appeared after the Minsk 2 treaty was signed by all involved parties and are downplayed by the Western/Ukrainian side to “further deescalate the situation”. In point of fact, the opposite is the case. It remains to be seen how the situation in the last two Ukrainian strongholds in the area, Lebedyns’ke and Shyrokyne, develops over the coming weeks and months. However the Russian intention to get back into striking distance of Mariupol seems clear as well as realizable as long as Ukraine and the west hushes up the seriousness of the situation there and along the entire front.